The EIU Alumni Association builds lifelong relationships between alumni and their alma mater, and works to make Eastern the best in the nation in integrating the academic and personal development of students. EIU Grad Packs: Exclusive offer for the class of 2019! Membership Credentials – you'll receive a membership card, auto decal and a “Life Member” lapel pin (if applicable). Bi-annual subscription to ForeverEIU, the Eastern Illinois University alumni magazine. The Winter 2019 issue (on the right, below) is out now! The Summer 2018 issue is available to view by clicking the image on the left, below. 10% discounts on in-store and online shopping at the EIU Bookstore. Other discounts on EIU clothing, travel, entertainment, online shopping (and more!) through the EIU Alumni Association’s Preferred Partner Program. Exclusive access to our Find-A-Friend program. Lost track of an EIU friend or old roommate? We can help! Advanced notification to special alumni events and outings. For a complete list of upcoming events, visit the Alumni Events page. Panther pride in supporting alumni association programs and activities! Funding various student scholarships and awards, including the Alumni Association’s Legacy Scholarship and the Distinguished Senior Awards. Instilling service, leadership and loyalty in students through involvement in events like First Night (freshmen welcome ceremony) and Panther Service Day (campus wide community services day). Enhancing student-focused service, including mentoring and leadership opportunities, educational programming, and assistance to student organizations. Supporting campus renovation and beautification projects such as the Alumni Quad and Centennial Clock Tower. Honoring alumni accomplishments through the Distinguished Alumni Awards program. Increasing the value of your degree by joining together to help maintain the excellence that is EIU. Uniting alumni through special events, volunteer opportunities, lifelong learning programs and more. Featuring news on campus, upcoming events and student/alumni success stories through ForeverEIU, the Eastern Illinois University alumni magazine, a publication for members of the Alumni Association. Maintaining alumni connections by finding “lost” friends and classmates, as well as offering valuable networking opportunities through social networking sites and alumni events. 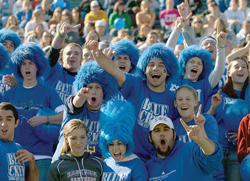 Call the Alumni Association at 800-ALUM-EIU (1-800-258-6348)!